Even minor traffic offenses can be worth fighting in order to protect your driver’s license and keep insurance costs down. Our Lexington traffic attorneys are ready to help. Some traffic offenses seem simple but can carry hidden penalties. According to a recent study, Kentucky insurance companies are the second least forgiving for accidents and traffic tickets in the US. If you receive a traffic charge, your options can be confusing. Should I go to traffic school? Can I go to traffic school? Is diversion an option? Do I have to go to court? What if the officer was wrong? Contact our Lexington DUI and Traffic attorneys at Baldani Law Group PLLC to figure out what to do next. We can listen to the facts and help you decide what is best for you. Call us now at (859) 259-0727 or contact us online to schedule your consultation today. When most people receive a ticket, they just pay the fine. Just because most people do this does not mean that you should. The Traffic Attorneys at Baldani Law Group PLLC can help you determine whether challenging a ticket or defending yourself in court will be beneficial. I contacted Bradley and right after we talked, he started taking action in my case. I really appreciate how quick he was able to get things resolved for me. I highly recommend him as a lawyer if you ever need it. If you are stopped for a traffic offense, you might feel scared or ashamed. However, the most important thing to remember is to remain under control and that the police are required to respect your rights. Speeding – It seems like a minor thing, but speeding ticket add up: they can increase your insurance, and if you get enough, they can suspend your license as long as a DUI. They also can prevent you from getting a new job, or making part time cash driving for Uber or Lyft. We know how to fight Kentucky Speeding tickets. Reckless Driving – Closely related to speeding is the charge of reckless driving. Reckless Driving can add points to your license and even further increase your insurance costs and keep you from lucrative new jobs. It also adds four points against your license, brining you even closer to a suspension. Leaving the Scene of an Accident – Everyone makes mistakes. Sometimes people get nervous, stressed, or intimidated and leave the scene of an accident or commit a hit and run. This charge can lead to your license being suspended for six months! That’s longer than most DUIs! We advise our clients to come to a stop as soon as it is safe to do so. Once stopped, do not rush to retrieve your license or insurance: officers can become concerned that you are reaching for a weapon or destroying evidence. It is best to place both hands on the wheel and look forward. In the state of Kentucky, the driver of the vehicle is required to produce identification during a traffic stop if requested by the officer. Once the officer approaches, roll down the window. Be polite. If you have a firearm in the vehicle, explain to the officer where it is, and if it is concealed, that you have a permit. Then inform the officer that you will be reaching into the glove compartment to produce any documents that he requests. If you are asked questions about the offense you are stopped for, you do not have to answer the question, though you may choose to do so. The days of “talking” your way out of a ticket are mostly over. In an era of reduced budgets and a need for more revenue, almost everyone gets ticketed. 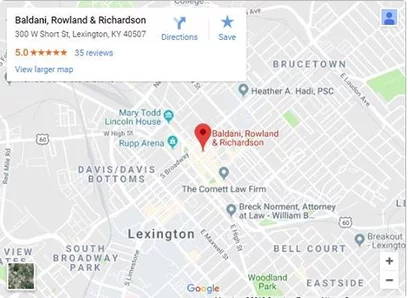 If you are facing a traffic offense in Lexington or anywhere in Central Kentucky, give our firm a call today. We’ve handled every type of traffic ticket, from ten over to 125 mph. We know the procedures and how to negotiate with the prosecution to have your charge dismissed or minimized as much as possible. Traffic Court can take hours out of your busy day. Let us handle it for you. Get a free consultation now and find out why our firm is the right firm for you. In addition to all of the collateral consequences to a traffic ticket, you face the following points assessed against your license. A good lawyer can have these points dismissed or minimized. A combination of two (2) or more violations of motor vehicle laws in one (1) occurrence – six (6) penalty points. More information about points can be found in 601 KAR 13:025. Is Diversion an Option for My Traffic Ticket? In Lexington, the Fayette County Attorney’s Office operates a traffic diversion program. Our firm has been successful at getting our clients placed in this program leading to their traffic ticket being dismissed. You are only allowed to do the Traffic Diversion Program once. In order to be eligible, you cannot have participated in the past, and you must have a valid license and insurance. You should apply to the program at least two weeks in advance of when you are supposed to attend court. Participation in the program requires paying a fee, completing a class, and performing a small number of hours of community service. Upon completion of the program, the case is dismissed and expunged from all court and Transportation Cabinet records. Most participants never have to come to court. If you have any traffic incident in Fayette County other than a DUI and otherwise meet the requirements, we can help you through applying and enrolling in this beneficial program. Please contact us as soon as possible, because enrollment is time sensitive. What Kentucky Traffic Offenses Carry Jail Time?